Because MIDAS is a fully featured web-based scheduling system, it's the perfect solution for managing your room and resource bookings if your business is spread across multiple sites/locations/premises, as it can be readily available at each through your corporate intranet or the wider internet! With this option, you add all your venues/rooms/bookable spaces from all your various sites/locations to a single instance of MIDAS. You can then create a "Venue Group" for each of your locations and assign all the venues from each location to the corresponding venue group. This allows users to filter the booking grid to show venues by location. You can further restrict, on a per user basis, which of these venue groups (and therefore which of your locations) each user has access to. Users from any of your locations can be restricted to only be able to view/access those venues at their own site, and not venues from other locations throughout in your business. At the same time, administrative accounts can be given full access to be able to view and access the booking schedule for all your locations on a single screen. Under this option, resources, settings, templates, invoicing, and clients are "shared" across locations. In addition, the URL for your MIDAS and login screen is the same for all users. Cost: For a business at 3 separate locations, with 30 venues/rooms/bookable spaces at each location, and 10 staff at each location, a single MIDAS license for 90 venues/30 users would be required. With this option, user's select with database (i.e. which of your site locations) they wish to login to from a shared login screen. Each database is independent from each other, meaning each of your locations can have their own separate resources, settings, templates, invoicing, and clients. 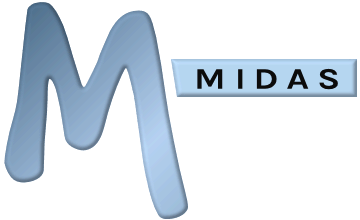 However, as with option 1, the URL of MIDAS and login screen is the same for all users. Cost: For a business at 3 separate locations, with 30 venues/rooms/bookable spaces at each location, and 10 staff at each location, a single MIDAS license for 90 venues/30 users/3 databases would be required. With this option, you simply setup and run a separate, independent, instance of MIDAS for each of your locations.This is similar to option 2, except you can have a different, unique, URL, and a different login screen for each of your locations (rather than a shared URL/login screen as with the first two options). As with option 2, resources, settings, templates, invoicing, and clients are separate for each location. Cost: For a business at 3 separate locations, with 30 venues/rooms/bookable spaces at each location, and 10 staff at each location, three MIDAS licenses - each one for 30 venues/10 users - would be required. How many "venues" and "users" do I need?